Please join us at Mystic Museum of Art for a celebration to mark the tenth anniversary of Poetry of the Wild. The evening will include a reading of poems featured in the boxes and an auction of selected poetry boxes. 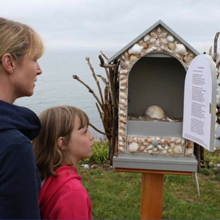 The anniversary celebration will also be the culmination of the project’s tour through Southeastern Connecticut with installations in New London, the University of Connecticut, Avery Point and, most recently, Mystic.